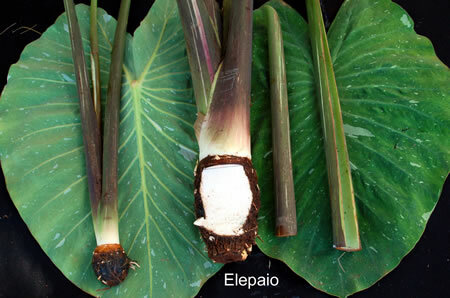 General Characteristics: Short to medium in height, moderately spreading, stocky, maturing within 7 to 12 months, producing from 5 to 10 oha; readily identified by green-and white-mottled leaves. Petiole: 50 to 75 cm, long, fairly rigid, green-and white-striped, often slightly tinged with reddish-brown, especially on lower half, yellowish at apex, pink at edge, a pale pink ring at base with white for 3 to 4 cm. above. Leaf blade: 35 to 50 cm. long, 25 to 35 cm. wide, 30 to 40 cm. from tip to base of sinus, ovate, fairly firm in texture, slightly concave, green-and white-mottled; margins undulate; piko small, yellowish; lobes acute with very narrow sinus. Inflorescence: Peduncle green-and white-mottled; spathe 17.5 to 18 cm. long, the lower tubular portion about 2.5 cm. long, green-and white-mottled, the upper portion yellow mottled with white, slightly open near constriction; spadix 6 cm. long, the sterile appendage 7 to 8 mm. long. 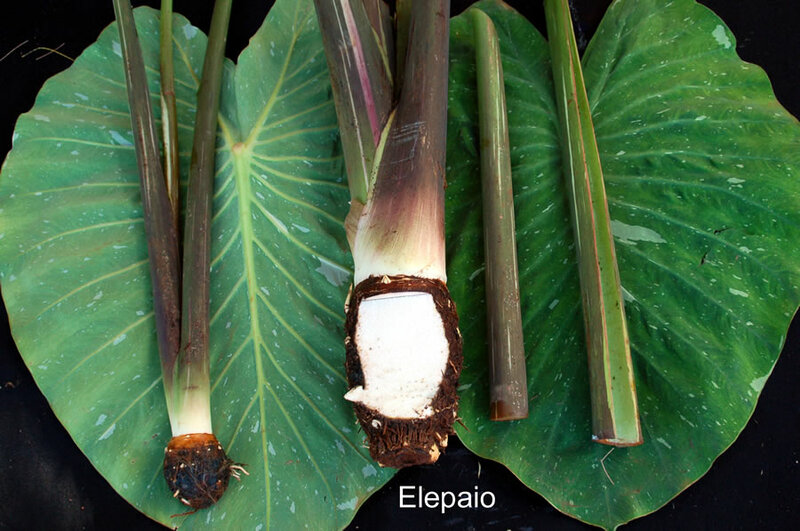 Origin, and derivation of name: Native variety; according to some natives it grew wild near the forest where the bird Elepaio made its home, but others maintain that this taro was formerly planted at dawn when the Elepaio was singing. Distribution: Found mainly on Hawaii in small patches, principally under upland culture; of little importance because of its low yield. Use: Makes good poi of a light gray color. Remarks: This variety displays true variegation, and the striking green and white mottling of the leaves makes the plant very attractive. The amount of white area varies to a certain extent, according to environmental conditions.